A female student at Alpine High School in west Texas has died of self-inflicted gunshot wounds after shooting another female student, ABC News reports. CNN reports that a responding police officer was also injured when another officer’s gun accidentally discharged. The victim was reportedly shot in the lower extremities and is being treated at a hospital; her current condition is not known. 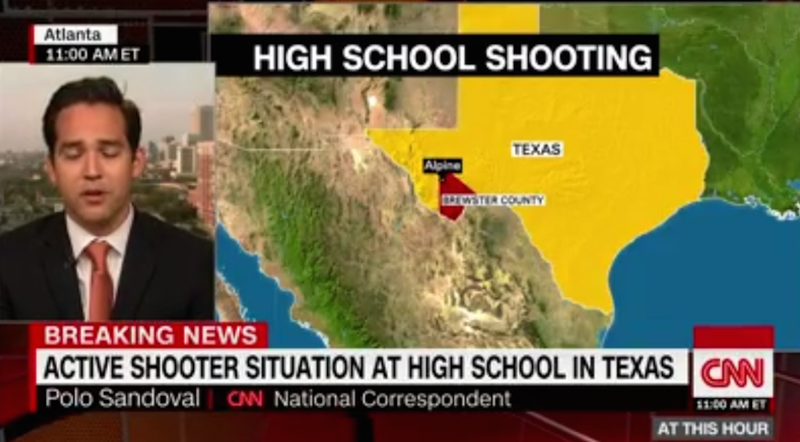 Brewster County Attorney J. Steve Houston told CNN that the shooting occurred in the school’s band hall. The Brewster County Sheriff’s Office initially reported that two shooters were on the loose, but is no longer seeking a second shooter; Alpine High School’s 280 students have been evacuated. Sheriff Ronny Dodson with the Brewster County Sheriff’s Office said they recovered a semi-automatic pistol next to the female student shooter’s body. He also said they found plenty of ammunition but didn’t say how much. Alpine police took the call about 9:25 a.m. CT, and the sheriff’s department was first on the scene. Dodson said that the initial investigation indicates about five shots were fired in the school. Dodson also said the female student shooter had only lived in Alpine for the last six months. He said he knows their grandparents. Talking to them, the grandparents said she was a straight A student and there were no indications of any problems. “This community did not expect this. We don’t want this and we can’t explain it yet,” Dodson told KWES-TV.